Not only the lubricants but also the logistics and the product design is steadily improved at Oest. 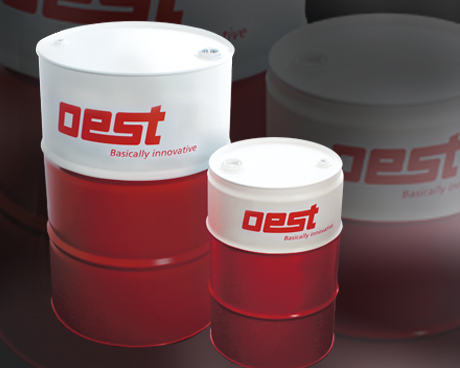 One current example is the change to the new 200 L and 60 L drums with the Oest branding on them. This is also a benefit for our distributor. Our environmentally compatible special fuel for all two-stroke air-cooled engines increases engine performance, prolongs engine life and ensures that your engine starts up perfectly and burns fuel cleanly. Oest Oecomix 2T is suitable for chainsaws, strimmers, two-stroke mowers, hedge shears, mopeds and much more! Oest is your ideal partner for lubricants, heating oils and fuels, natural gas and electricity. You have also come to the right place if you are looking for adhesive and PUR technology. Oest also has a petrol station division, which we operate as shareholder of AVIA.